Just wanted to highlight a new research project that the Federal Reserve Bank of Atlanta has undertaken. Executive Vice President David Altig explains over on their macroblog what exactly the graph below represents. Basically they identify 13 labor market variables that are important to track and categorize them as Leading Indicators, Employer Behavior, Confidence and Utilization. You can see these labeled on the outer ring. The dark red, outside circle represents these indicator’s values in 2007q4, or the peak of the business cycle prior to falling into recession. 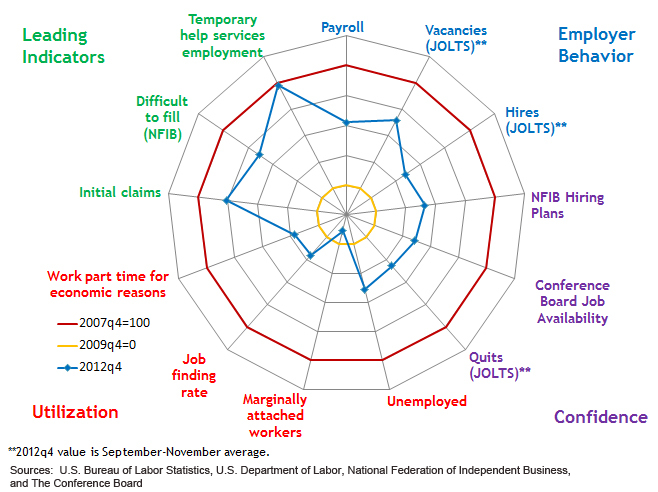 The yellow, inner circle represents their values in 2009q4, or the bottom of the employment cycle. In order for the labor market to get back to pre-recession levels, each indicator has to climb back to the red line. Each grey ring represents 25 percentage points of improvement. The blue line are the current values for the indicators in 2012q4. The simplest way that I read the graph is that the employment leading indicators are nearly all the way back to pre-recession levels; employer behavior is about 50 percent back; confidence in the economy and labor market is only about 25 percent back, while there has been effectively no improvement in the utilization. The graph doesn’t paint a pretty picture, but then again the current state of the labor market isn’t that pretty to begin with. Two takeaways for me: First, some of the indicators or categories are necessary but not sufficient conditions for strong labor market improvements. We’re getting movements or improvements in the positive direction however strong overall improvements aren’t quite there yet, but we’re making progress, albeit slowly. Second, I really like the concept and visual representation used by the Atlanta Fed here and wanted to pass along. Josh, thank you for sharing this interesting way to view the data. I have two comments. First, it might be more representative to see this data with the red line being the average for a full business cycle, rather than for the credit- and housing-induced bubble peak of late 2007. I don’t think it should be a policy goal to get back to the peak of the last bubble. Second, where’s the spider in that web?